You can pick 36" wide or 48" wide on each style. Upgrade that bookcase you've had forever to one that will last and impress. The glass doors of this bookcase protect your books and belongings from your busy household. Both larger and smaller versions of this style bookcase are available through Amish Furniture Factory. Pictured in qs white oak with FC10901 Golden Brown stain. This solid oak bookcase offers both a beautiful way to organize your books and collections. The two glass doors open outward for easy access to your belongings. The Amish Mission styling of this cabinet is showcased with simple lines, parallel slats in the glass-paneled doors and solid metal latches for handles. 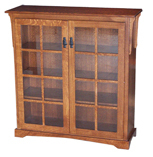 A larger version of this style bookcase is available through Amish Furniture Factory. Sophisticated and useful, this bookcase is a great complement for any room in your home. The oak case is an elegant option for your growing library. The glass doors showcase a unique panels with subtle, beautiful design. Look no further for a classic Mission-style bookcase! A smaller version of this style bookcase is available. With four large shelves enclosed with hinged doors with glass panels, this barrister bookcase is an elegant means to organize your books. A home library deserves a beautiful bookcase like this Mission style model. The top and bottom of the bookcase has subtle Mission-style features like geometric etching and arches. This bookcase also has a pull-out drawer below the shelving space. This extra space is perfect for those items you like to have close at hand—games, crafting supplies or decorations. This corner bookcase has lovely construction with beveled corners, an arched base skirt, and an arch beneath the top. It's an heirloom piece to finish a corner of any elegant room. This bookcase adds storage and decor to a corner and it's hardwood to last as long as your other heirloom furniture. The bottom doors have rectangular panels in the Mission style. The long corner sides of this bookcase are beveled, while the top and base skirt boast arches for a completely classic design. This bookcase combines style and purpose with ample wooden shelving and fashionable glass doors. The two glass doors open outward for easy access to your belongings. The center column of shelves is a space to showcase collectables. The Modesto 10 Shelf 6' Double Bookcase is elegant in style with an arch skirting each half of the top, and six exposed mortises decorating the corner joints. The Modesto's outer legs run straight, but beginning three quarters down, fan out to wide feet. This large book shelf styles a whole study or hallway in classic wood.